The prototype Samsung 5G phone made its second public appearance at the CES 2019 in Las Vegas. Samsung had the phone on display somewhere in the midst of its gigantic booth at the event. It’s the same device that Samsung and Verizon used to show off 5G capabilities back in December, during Qualcomm’s Tech Summit in Hawaii. 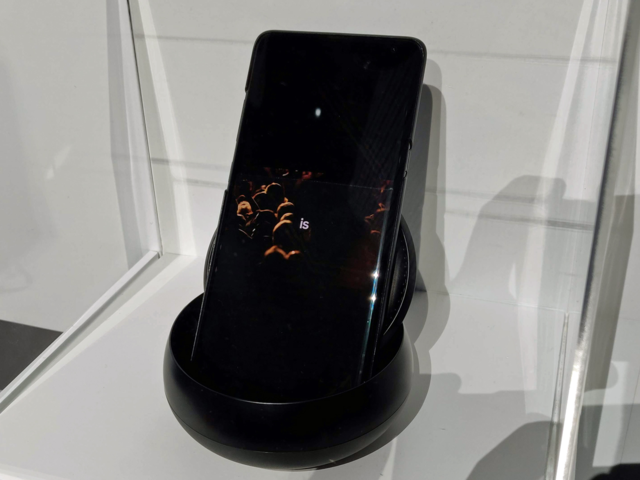 The phone on display at the CES 2019 was caged in a glass enclosure, with the display cycling through a canned demo which showed off some of its functions. The demos did not appear to show its 5G capabilities. Its design was obscured with a dark case. The prototype 5G phone that Samsung displayed at the two events was, indeed, just a prototype. It carries an odd corner notch, which is something the final unit almost certainly will not have. The 5G Galaxy S10, and other S10 variants, will come with a punch-hole display. Samsung will reportedly unveil the Galaxy S10 in San Francisco next month, a week ahead of the MWC in Barcelona. A teaser for the launch is already doing rounds online. The 5G Galaxy S10, however, is not expected to hit the market alongside the other three variants. It may arrive later when 5G networks go live in the US and South Korea. I don’t get what is the point of showing it if they don’t even try to show to people interested what 5G is really capable of, atleast a small introduction demo. Waste of booth space. Video of the demo that it displayed ?